(2005) "Jesus, Take the Wheel"
Underwood's recording of the song, released on June 14, 2005 in the U.S., debuted at number one on the U.S. Billboard Hot 100 and on the Canadian Singles Chart, where it remained for one and seven weeks, consecutively, atop the charts. It was the longest running single of 2005 in Canada. Although Underwood's recording was not released to country, the song charted at number fifty-two on Hot Country Songs. It was certified Gold by the RIAA and two times platinum by the CRIA, and it was later included on her debut album, Some Hearts. 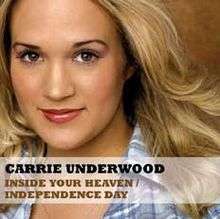 The B-side is a cover of the Martina McBride song "Independence Day". Credits are adapted from the liner notes of the CD singles. 1 2 "How the American Idol coronation singles stack up, part 1". Content.usatoday.com. 2009-06-04. Retrieved 2011-10-16. ↑ "Week Ending Aug. 29, 2010: Life's Ups & Downs - Chart Watch". New.music.yahoo.com. 2010-09-01. ↑ "Week Ending Aug. 29, 2010: Life's Ups & Downs - Chart Watch". New.music.yahoo.com. 2010-09-01. Retrieved 2011-10-16. 1 2 Inside Your Heaven (CD single). Carrie Underwood. Arista Records, 19 Recordings Limited, S Records. 2005. 82876 70859-2. 1 2 Inside Your Heaven (CD single). Bo Bice. RCA Records, BMG Music Entertainment, 19 Recordings Limited, S Records. 2005. 82876 69495-2. ↑ "Carrie Underwood". Allmusic. Rovi Corporation. 2004. Retrieved April 25, 2009. ↑ "Carrie Underwood – Chart history" Billboard Hot 100 for Carrie Underwood. Retrieved February 10, 2011. ↑ "Carrie Underwood – Chart history" Billboard Adult Contemporary for Carrie Underwood. Retrieved February 10, 2011. ↑ "Carrie Underwood – Chart history" Billboard Hot Country Songs for Carrie Underwood. Retrieved February 10, 2011. ↑ "Bo Bice". Allmusic. Rovi Corporation. 2004. Retrieved April 25, 2009. ↑ "Bo Bice – Chart history" Billboard Hot 100 for Bo Bice. Retrieved February 10, 2011. ↑ "Top Hip-Hop and R&B Songs & Singles Charts". Billboard. Prometheus Global Media. Retrieved 2011-01-03. 1 2 "Gold and Platinum - July 2005". CRIA.ca. Canadian Recording Industry Association. Retrieved 2012-07-01. ↑ "RIAA - Gold & Platinum: Carrie Underwood singles". RIAA.com. Recording Industry Association of America. Retrieved 2012-07-01. 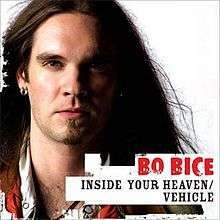 ↑ "RIAA - Gold & Platinum - August 01, 2010: Bo Bice certified singles". RIAA.com. Recording Industry Association of America. Retrieved 2012-07-01.